Class of 2018: Cindy Satterwhite Jarboe ’77, P ’11 welcomes President Emeritus W. Taylor Reveley, III LL.D. ’18 and Helen Bond Reveley as honorary alumni. 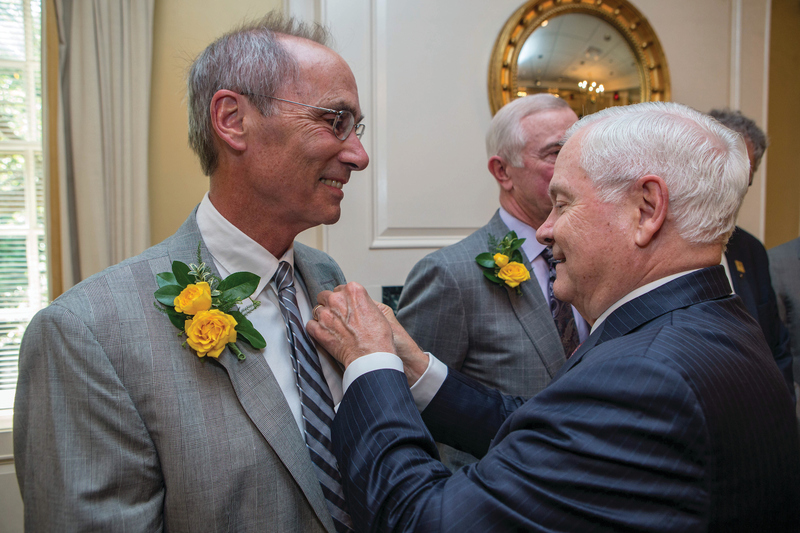 In May, the William & Mary Alumni Association inducted six new honorary alumni into its ranks at the annual induction ceremony. The honorees, including William & Mary President Emeritus W. Taylor Reveley, III LL.D. 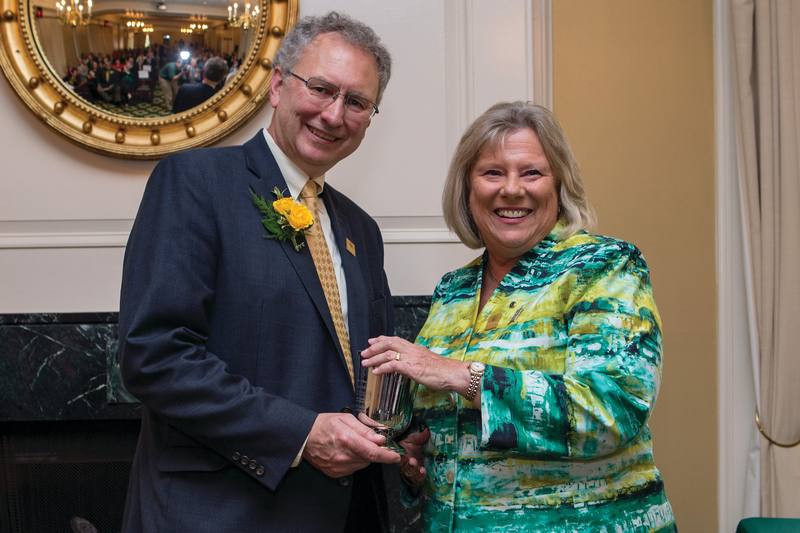 ’18, were recognized for their exceptional service, support, advocacy and commitment on behalf of William & Mary and its schools, departments, organizations and boards. “To all of our new honorary alumni, congratulations. 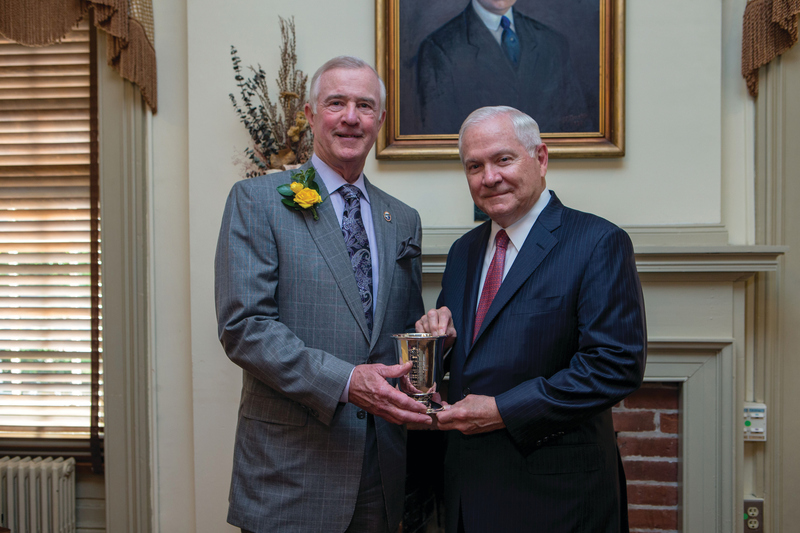 Your devotion to William & Mary began not as students, but it is as deeply held as any alumna or alumnus,” said Chancellor Robert M. Gates ’65, L.H.D. ’98, in remarks during the ceremony. Honorary alumni are non-graduates of William & Mary who have gone above and beyond in their support of the Alma Mater of the Nation. Throughout the year, the Alumni Association accepts letters of nomination for this distinguished award. The Alumni Association’s Board of Directors then votes on the final awardees. Since the Honorary Alumni Ceremony began in 1994, 104 individuals have been inducted into the Alumni Association. Many previous honorees were in attendance at this year’s ceremony. The Honorary Alumni Ceremony is one of several awards and recognition programs that the Alumni Association holds throughout the course of the year. Other events include the Alumni Medallion Ceremony, the Douglas N. Morton ’62 Alumni Service Awards, the Olde Guarde Distinguished Service Award and Student Academic Prizes. A steadfast presence at William & Mary and a passionate supporter of his adopted alma mater, Joe Gofus is a treasured member of the Tribe. For decades, he and his late wife, Nancy Burgess Gofus ’75, have been a caring and generous force for good at the university. When she became chair of the foundation board, Joe Gofus’ support and enthusiasm for the university grew even stronger. He was with her every step of the way, dedicating his time to their volunteer work and campus events, always committed to ensuring the William & Mary community thrives. Joe Gofus’ long and successful career as a meteorologist and computer systems analyst at the National Oceanic and Atmospheric Administration inspired him to support Arts & Sciences in a multitude of ways, including contributing to the Cabell Challenge, which provided science equipment for the new Integrated Science Center. Both Joe and Nancy Gofus were first-generation college students and scholarship recipients, which fostered their shared passion for affording opportunities for exceptional students through scholarships at William & Mary. Joe Gofus encourages students to appreciate their William & Mary education and reminds them of their responsibility to give back when they are able. When Steve Johnsen sees an opportunity for the advancement of research, teaching excellence and community engagement at William & Mary’s Virginia Institute of Marine Science (VIMS), he makes it happen. Steve Johnsen has served as president of the VIMS Foundation for three years, during which time the VIMS campaign grew by more than $10 million. Under his leadership, the foundation launched robust oversight initiatives including new audit and governance committees, advocated with VIMS for a new Richmond lobby day and helped VIMS secure public funding to build its Eastern Shore campus. Steve Johnsen oversaw the merger of three VIMS boards, which brought a new level of cooperation and greater effectiveness to their work. In 2016, he was awarded the Freeman Volunteer of the Year Award by VIMS in recognition of this effort. He led initiatives to establish the Bonnie Sue Internship Program on the Eastern Shore, which gives youth exposure to marine science, VIMS and W&M through a summer research internship. For their active role in their community, Steve Johsnon and his wife, Barbara Johnsen Ed.S. ’90, Ed.D. ’95, were recently named citizens of the year by the Eastern Shore of Virginia Chamber of Commerce. They were pivotal in bringing to VIMS a sculpture by Eastern Shore artist David Turner ’83 that now graces Waterman’s Hall circle. The research vessel Peregrination, designed to support the field research of Chris Hein, assistant professor of marine science, also joined the VIMS fleet thanks to their generosity. Steve Johnsen strengthens relationships between VIMS and the larger William & Mary and Eastern Shore communities through his many leadership roles. He has served on the advisory board and foundation board of directors of Eastern Shore Community College, spearheaded a fundraising campaign for the Montessori Children’s House of Franktown, served on the board of the Chesapeake Bay Bridge Tunnel, and was recently named by Gov. Ralph Northam to the Virginia Commonwealth Transportation Board. Before his retirement, he was president and CEO of the Flagship Group, Ltd. and executive vice president of Brown & Brown Insurance. In a decade of extraordinary service to William & Mary as its president, Taylor Reveley has built a genuine sense of community that has strengthened the entire university family and infused a renewed sense of pride in the Alma Mater of the Nation. After serving as dean of the law school for 10 years, he became the 27th president of William & Mary during a time of uncertainty. His steadying hand united and advanced the university we all hold dear, bringing together the support of students, faculty, staff, alumni and friends. Taylor Reveley has worked tirelessly to enhance William & Mary’s preeminence in the nation and the world, increasing the visibility and prestige of the university. He has guided the reshaping of the academic curriculum, enhanced the physical footprint of campus and introduced a strategic planning process to set W&M on a course for success well into the future. He also successfully merged Alumni Association and University Advancement operations, streamlining and greatly enhancing alumni communications and services. He has led the most ambitious fundraising campaign in the university’s history, which is building a firm foundation of academic excellence, financial security and alumni engagement for generations to come. 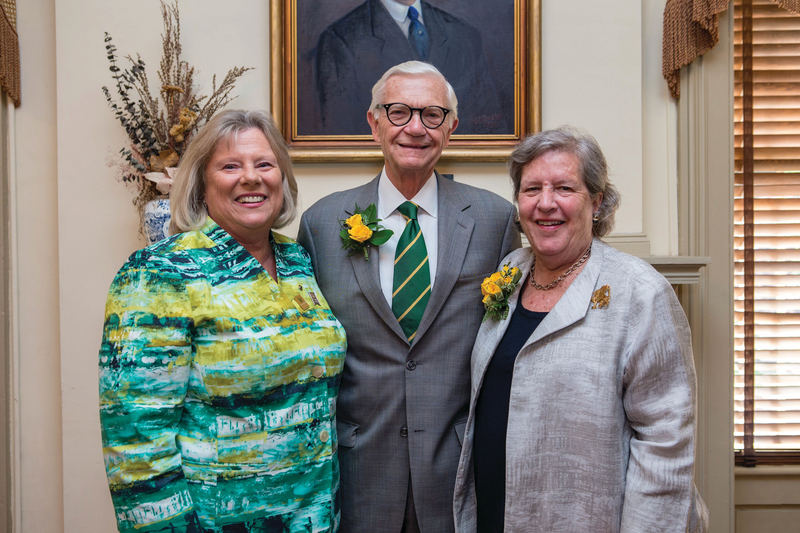 Under his leadership, alumni, parents and friends have strengthened their ties with the university, with Taylor Reveley personally leading the way through his enthusiastic participation and fervent dedication to building stronger connections between all members of the William & Mary family. Helen Reveley has served actively as First Lady of William & Mary, attending countless university events and ceremonies, enthusiastically giving of her time and talent. She has graciously hosted alumni, students, faculty, staff, community members and honored guests in the President’s House, making all feel welcome. As loyal confidant to Taylor Reveley, her steady hand and sound judgment played an enormously important role as he led the university with great distinction. For 30 years, Schwartz has admirably led the Roy R. Charles Center for Academic Excellence, which supports faculty development, student research and active learning as well as honors and interdisciplinary studies. Throughout his tenure, he has engaged the entire William & Mary community in his passion: giving students opportunities to become better versions of themselves through learning and dedication to service. Schwartz has played an important role in the growth of Arts & Sciences through his successful fundraising efforts, including securing key grants from the Andrew Mellon Foundation and increasing private funding for the Honors Fellowship Program. He initiated the freshman seminar program in Arts & Sciences, transformed the Charles Center into the nexus of interdisciplinary studies at William & Mary and helped establish undergraduate research as a vital component of a William & Mary education for multiple generations of students and faculty. Schwartz came to William & Mary in the 1980s after earning his Ph.D. from University of California at Berkeley and serving on the faculty of Oberlin College. As the Wiengartner Professor of Government, he teaches political philosophy and classes in the COLL curriculum on citizenship and community. A hands-on participant in his programs, Schwartz’s enthusiasm for advancing William & Mary is influential. He created the Sharpe Scholars Program for academic service learning and he has been a champion for diversity of faculty and students. He also administers the Teaching Project, which provides opportunities for faculty to learn from and mentor one another. 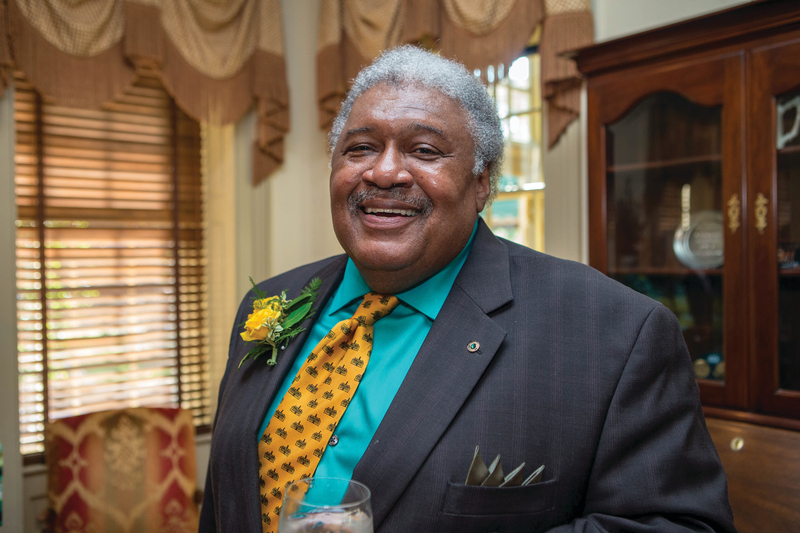 Thomas has been a dedicated and energetic part of the William & Mary family for more than a quarter century. He is a role model to undergraduate and law students alike, not only for his inspiring words but also for his actions and accomplishments. Since 1990, Thomas has set William & Mary Law School students on the road to success with his first day, first year lectures. He has given the law school’s commencement address twice in 25 years, and in 2012 he also served as the law school’s commencement speaker and panelist at the first African-American Law Alumni Celebration. In 1983, Thomas became the first African-American justice of the Virginia Supreme Court, and the youngest, at just 32 years old. He has taught appellate practice at the University of Virginia Law School, serves as senior partner at Hunton & Williams, is a trustee of the Thomas Jefferson Foundation at Monticello and sits on the Court of Arbitration for Sport in Lausanne, Switzerland. Yet he still finds time to serve the Alma Mater of the Nation. Thomas is the longest serving member of the Board of Visitors in modern history, serving consecutively since 2006. He sat on William & Mary’s Commission for the Tercentenary in 1993, and since 2012, he has been a member of the Monroe Commission and serves as special advisor to the Design Review Board, which ensures the architectural consistency of the university’s buildings and grounds.